…including the recipe you’ve all been waiting for! In the lead up to The Wellness Show, my new friend Rebecca asked me to participate in the Media Muffin Baking Competition. I was hesitant to do so at first, only because 1) I was going to be in the midst of exams, and probably should keep my attention focused on that, and 2) was I really even media? Rebecca assured me that blogging is the new media, and somehow twisted my rubber arm to enter (let’s be honest – a competition that involves baking? Totally my thing). The one catch – our muffin recipes had to somehow be related to the theme of the competition, which was Mothers and Mother’s Day. And since it was sponsored by Rogers Foods, we had to include Rogers flour – which was easy enough to do when a package of it was delivered to my door. 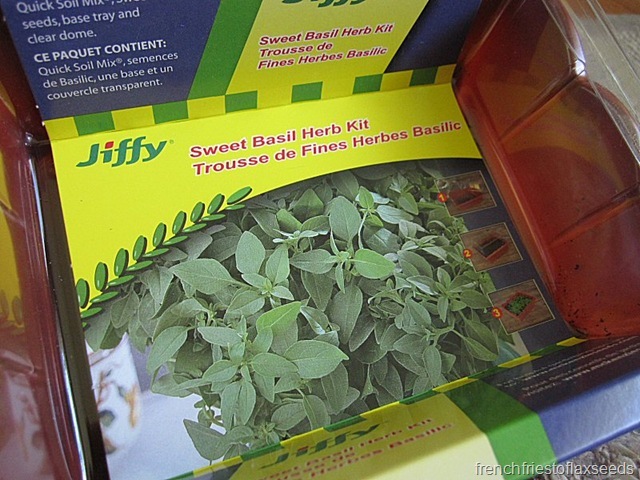 I started my recipe development by consulting the most obvious person – my mom! Seeing as it was a Mothers themed contest, who better, right? I figured it should be a muffin my mom would enjoy, so I asked her for some criteria, we tossed around a few ideas, and I mulled over it. One day I went for a walk, and the recipe started formulating itself in my head. After consulting some cookbooks for dry to wet ingredient ratios (hey, baking is a science), I jotted down the basics of the recipe, and set out making a test batch of muffins, in two varieties, since I hadn’t decided fully on one of the ingredients. I employed my whole family, my sister’s boyfriend, and my mom’s friend to try out the muffins and let me know what they thought worked, what they would change, etc. Surprisingly, there was very little that needed changing, so my recipe was ready to go. My last exam was on Thursday, and the muffins had to be delivered to the show on Friday. Alas, I also had to work Thursday night until 10 pm, so I was up early Friday morning to make sure I had them baked, cooled, and packaged up for their transit ride downtown. Away I went, with muffins in tow, on a sunny Friday afternoon. I had to take a couple to my sister,to bribe her to let me park at her work so I could take the train down. She left me a message on my cell letting me know they tasted great. Good thing, since I hadn’t tried them out myself before leaving – not that I would have had time to make another batch had they sucked anyways. 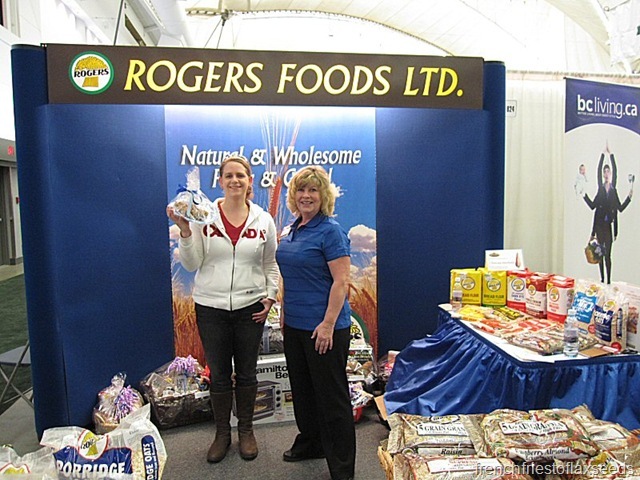 I arrived at the show, met up with Rebecca, and dropped off my muffins at the Rogers Foods’ booth. We took pictures with me and my muffins, and then I was presented with a goodie bag, just for entering the contest. Off to work I went, wondering what the results of the competition were. I had to check my phone on my break, where I found out that my muffin had taken 2nd place in the competition! The dark horse unknown blogger, up against media personalities from our local TV, radio, and magazines did pretty damn well, if I do say so myself. The prize for 2nd place is $200 donated to the charity of your choice. 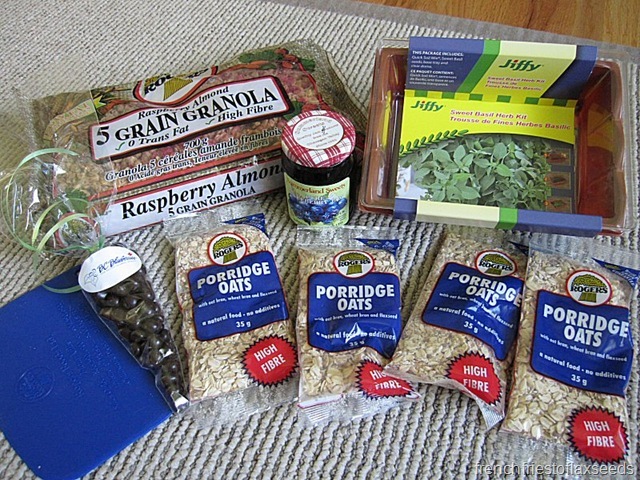 I’ve chosen the Share Society Food Bank – the local food bank in my area of Metro Vancouver. I think it’s only fitting, for a foodie and food related contest, no? Without further adieu, it’s time for the recipe! 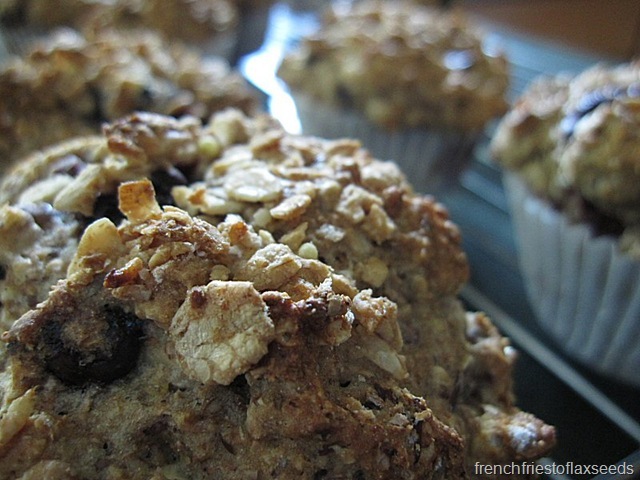 These muffins are inspired by my mother, who is a member of a local hiking group. 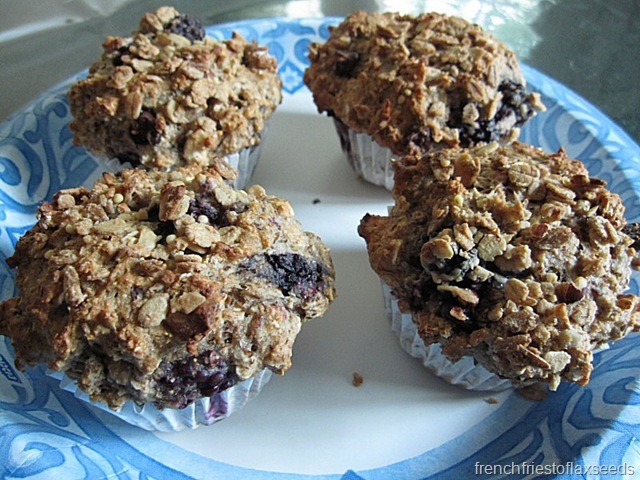 I wanted to create a muffin that would make a hearty, healthy snack on the trail, and that would be equally enjoyable with a cup of coffee or tea for breakfast. 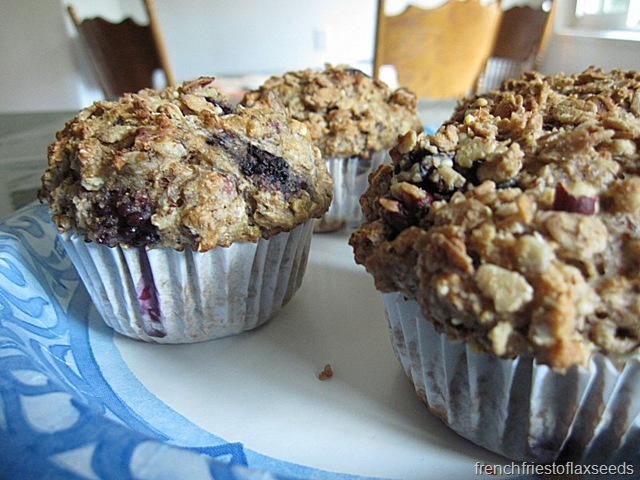 Subtly sweet, packed with fibre, and full of flavour, these muffins will satisfy the hungriest of hikers, including my mom! Preheat oven to 400˚ C.
Combine ground flaxseed and milk in a bowl. Set aside. 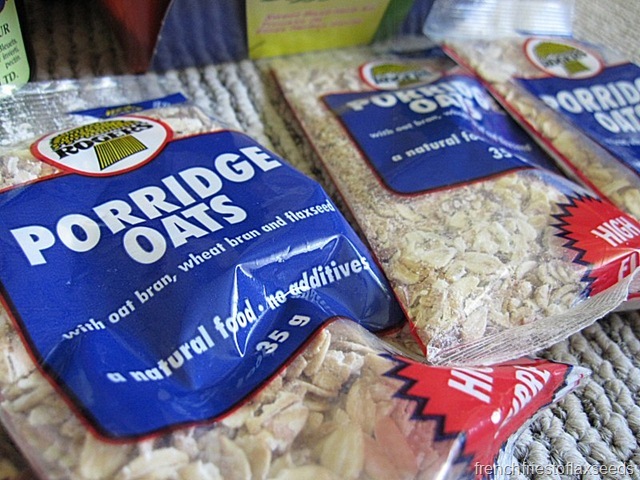 In a large bowl, combine flour, oats, baking powder, baking soda, nutmeg, and salt, mixing well. Add blackberries, hazelnuts, and chocolate chips to dry ingredients, so they are all coated in flour. 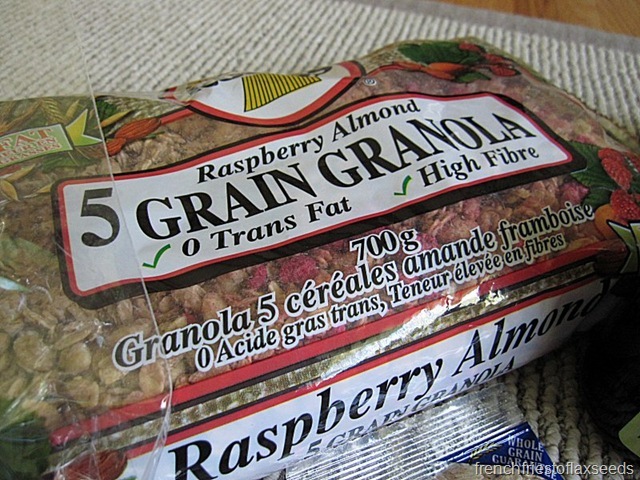 In another bowl, combine yogurt, maple syrup, vanilla, and flaxseed/milk mixture. Make a well in the dry ingredients, and add wet ingredients, mixing until just combined (batter will be very thick – add extra milk if too dry). Do not over mix. Equally divide mixture into 12 lined muffin cups or greased muffin tin – they will be very full. 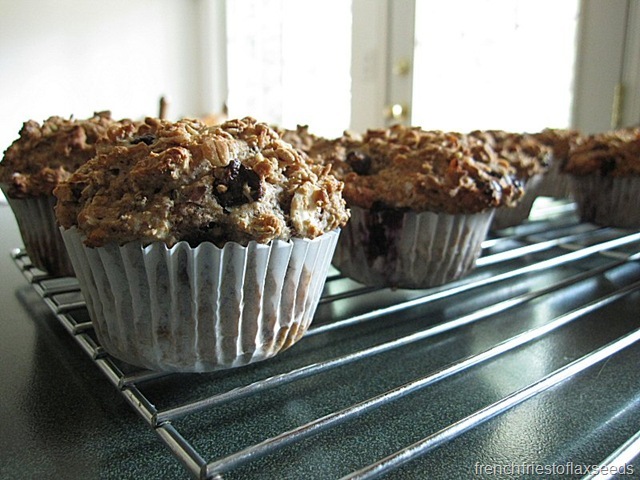 Top each muffin with a small amount of granola (if using). Bake for 18 – 20 min, or until muffins are golden brown. 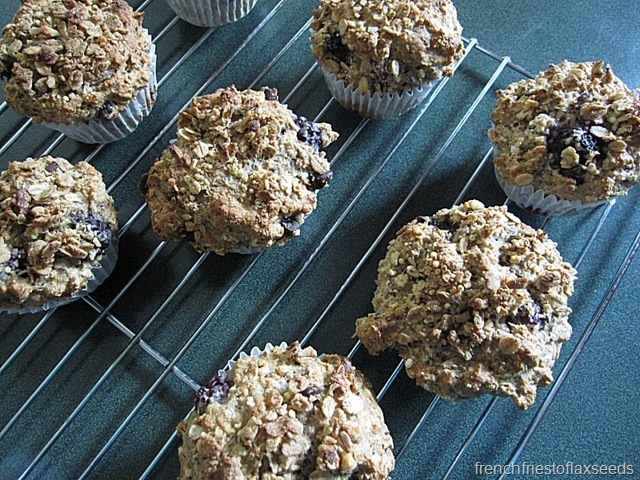 These muffins can easily be made vegan by substituting non-dairy milk and yogurt. 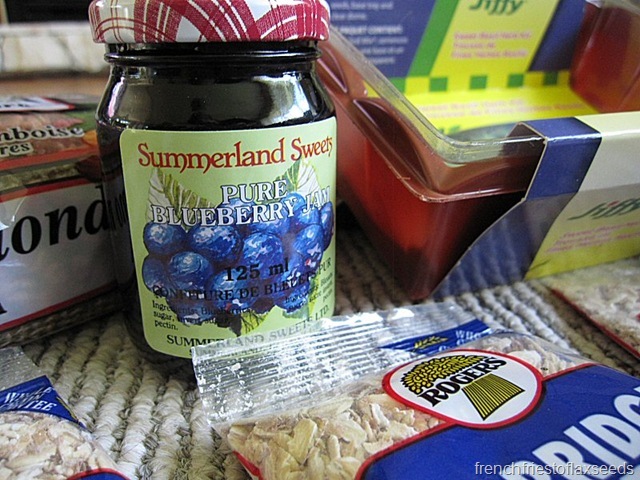 Substitute other berries, like raspberries or blueberries for a different flavour. Substitute your favourite nut for the hazelnuts (pecans or walnuts would be great). If you get a chance to make these muffins, let me know! Congrats Marianne, thats awesome! 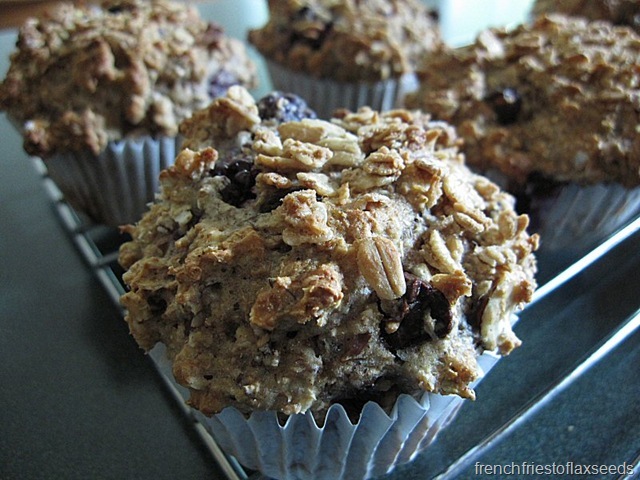 The muffins look delish too – very hearty and flavourful. Congrats, Marianne! I wonder what the first place winner made because these muffins of yours look pretty damn amazing!! I’ll be saving this one for sure. Wow!!! CONGRATS!!!!!!!!!! I had no idea!!! 🙂 Now I’m totally going to have to try the recipe!!! BTW – whom did you beat?